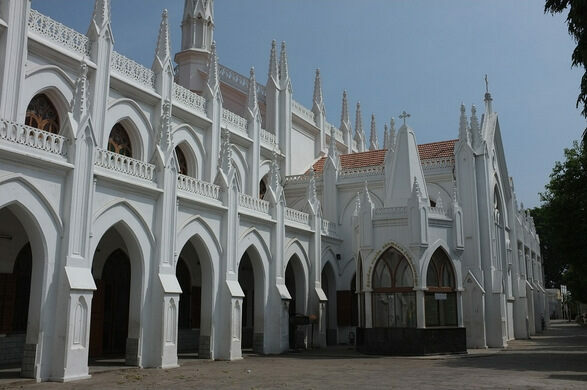 Boasting a towering steeple and an ornate interior with magnificent stained-glass windows, San Thome Basilica is an impressive bright white structure that dates back to 1893. It was constructed by British colonial authorities to replace an older structure from the 16th century, built by Portuguese colonists atop what was claimed to be the tomb of Saint Thomas the Apostle. 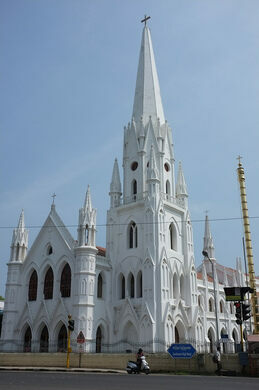 Despite consensus among historians to the contrary, Catholic tradition states that Thomas arrived in Kerala from Judea in 52 CE and preached between 52 CE and 72 CE. According to this story, he spent the final years of his life preaching on a beach in what is now Chennai, and was ultimately martyred on nearby St. Thomas Mount. 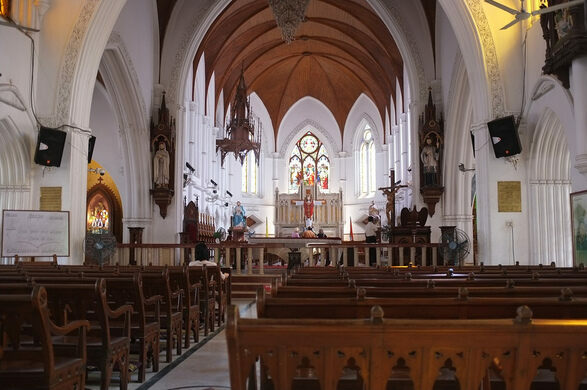 While modern Church scholars recognize that there is no actual evidence of these events, as accounts of the saint’s time in India were written centuries after the fact, the traditional version is still highly significant to South Indian Christians—a.k.a, Saint Thomas Christians. 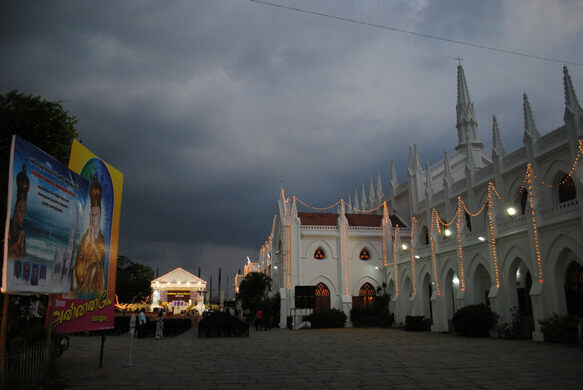 Indeed, Saint Thomas is still regarded as the Patron Saint of India. The Basilica is built over the place where Thomas was said to be entombed after his martyrdom. Though most of his remains were subsequently transported as far away as Mesopotamia and Italy, a modern chapel in the basement of the Basilica is said to contain a small bone from the saint’s hand, as well as the weapon that killed him. It is one of three churches in the world that was constructed on the tomb of an apostle. The other two churches are St. Peter’s Basilica in the Vatican, and Santiago de Compostela Cathedral in Spain. This crumbling medieval basilica once attracted pilgrims by the thousands to collect a miraculous dust that formed above the saint's tomb.